The Illyrian Sheepdog (in Albanian: Deltari Ilir, Qeni i Sharrit, meaning Illyrian Dog or Dog of Sharr; Macedonian: Шарпланинец; Serbian Cyrillic: Шарпланинац, literal translation: [Dog] of the Šar Mountains or Šar Mountain Dog, also known as Sharplaninac/Sharplaninec or Yugoslav Shepherd Dog-Šarplanina) is a dog breed of the livestock guardian type originally from the border area between Kosovo, Macedonia and Albania (the Sharr mountains). The Illyrian Sheepdog is a large, strongly built dog. The body is slightly longer than the height at the withers, and the front legs account for approximately 55% of the height. The head is large but proportional to the body, with dark eyes. The Illyrian Sheepdog is a robust, well proportioned dog with plenty of bone, of a size that is well above the average and with a thick, long, rather coarse coat that emphasizes the short coupled appearance. According to the FCI breed standard males should weigh between 35 and 45 kilograms (77 and 99 lb) with females slightly smaller at around 30–40 kilograms (66–88 lb). The average height is quoted as 62 centimeters (24 in) for males with females at 58 centimeters (23 in). The coat is dense, about 4 inches (10 cm) in length, and can be rough or smooth. ColourAll Illyrian are solid in colour: fawn, iron grey, white or almost black; usually sable or gray with darker "overalls" on the head and back, the undercoat being paler. The colour need not be completely uniform, and most Illyrian Sheepdog have several different shades of the same colour fading into one another. There are no bicolours and no uniformly black-coated dogs among purebreds, but odd-coloured specimens do exist. The dogs must not have large white patches in their coat. The temperament of the breed is described as independent, reliable, protective but not snappy, incorruptible and devoted to its master. The breed is aloof with outsiders, and calm until a threat to the flock presents itself. The breed has an extremely protective nature. In the absence of a flock of sheep, the Illyrian Sheepdog will often treat its humans as sheep - herding them away from danger or undesirable areas. They are serene and majestic, gentle with children and smaller dogs. They are also highly intelligent and bred to work without human supervision while guarding the flocks in the high pastures. Young pups can kill small animals until trained not to hunt. Like many of its cousin Mountain dogs, the Illyrian Sheepdog is a very serious and dedicated guard dog. Due to this, they are naturally suspicious of strangers and will need good socializing at a young age to lessen this innate personality trait. They are calm and gentle with their family but when faced with danger they become a formidable foe, not a suitable breed for all. Consistent and firm training is essential to ensure compliance. The Illyrian Sheepdog is a reserved and intuitive breed, stubborn and undemonstrative, but if properly trained and handled with authority, it excels at a variety of tasks. Dog-aggression and wariness of strangers are common traits of the Šarplaninac, which is why early socialization is of utmost importance. Heavily-boned and muscular, the dog has a full top-coat, with an abundant dense undercoat, making it weatherproof and suited for an outside life. The Illyrian Sheepdog has been known to fight or chase off wolves, lynxes and even bears. The breed can also work cattle and serve as a guard dog. They were first used as military dogs in 1928 by the army of the Kingdom of Serbs, Croats and Slovenes and later under Josip Broz Tito in the Socialist Federal Republic of Yugoslavia. Nowadays these dogs are used by the Military of Serbia as guard dogs in mountainous regions. Since 1975, successful exports have been carried out to the United States and Canada to control coyotes, and the Illyrian Sheepdog is now gaining recognition as a hard-working, able flock guard in these two countries. Fédération Cynologique Internationale: Official FCI-Standard N° 41, Published 24 November 1970. – Retrieved on 14 February 2015. The breed was initially standardised by the Yugoslavian Federation of Cynology (Jugoslovenski kinološki savez, JKS) and recognised as a Yugoslavian breed with two types by the Fédération Cynologique Internationale (FCI) in 1939 under the designation Ilirski ovčar (Illyrian Shepherd Dog), FCI-Standard N° 41. Kraški ovčar and Šarplaninac were considered Type A and B of the breed. In 1957 the General Assembly of the F.C.I. 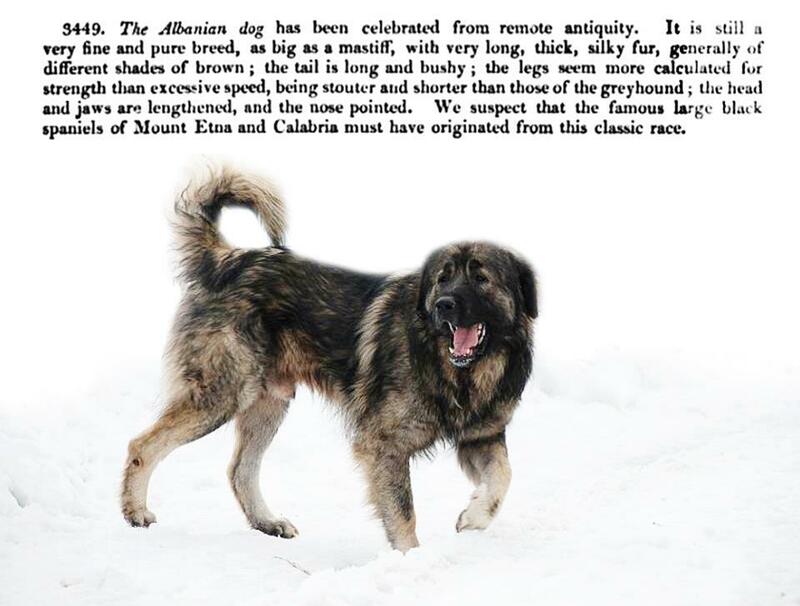 accepted a motion proposed by the Yugoslavian Federation of Cynology to change the name of the breed to Jugoslovenski ovčarski pas Šarplaninac (Yugoslavian Shepherd Dog Sharplanina), and this is the official name of the breed. After the collapse of Yugoslavia, Macedonia and Serbia were recognised as the countries of origin. In 1968, type B was recognised as a separate breed under the designation Kraški ovčar(Karst Shepherd Dog), FCI-Standard N° 278. United Kennel Club: Official U.K.C. Breed Standard, Revised 1 July 2009. – Retrieved on 30 March 2010.